2017-2018 Theatrical Release! Over $1,300,000 box office! Festival Hit! Tribeca Film Festival. L.A. Film Festival, Deauville Film Festival, American Film Festival and more! 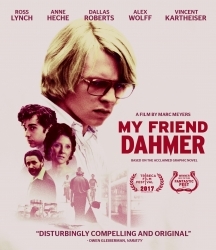 'My Friend Dahmer' screenplay landed a spot on the coveted 'Black List', ranking it as one of the best unproduced screenplays (at the time) before becoming a hit movie. Features an all-star cast that includes Emmy Nominee Anne Heche (Donnie Brasco), SAG Award winner Vincent Kartheiser (AMC's “Mad Men”), Former Disney star Ross Lynch (“Austin & Ally”), Alex Wolff (Patriot’s Day) and Dallas Roberts (3:10 To Yuma). Meyers makes 'My Friend Dahmer' a convincing high school drama, but his portrait of the serial killer as a young man telegraphs Dahmer's future all too clearly. A morbidly fascinating peek behind the blood-stained curtains. A warped wonder of a movie about a cannibalistic serial killer's awkward teenage years-it takes twisted to areas few have investigated. As My Friend Dahmer slowly steers its protagonist toward his historical fate, the result is crushing. Writer-director Marc Meyers turns Backderf's celebrated book into an absorbing, dramatized portrait of casual cruelty and teenage desperation, equal parts The Virgin Suicides and The Texas Chain Saw Massacre. This film is sensitively wrought. It's credible in its evocation of mid-'70s suburbia. The acting is excellent throughout, and Ross Lynch in the role of Dahmer elicits genuine sympathy for an increasingly lost but not yet monstrous soul.